I am sorry I have not been blogging as regularly as usual, however I have an excuse (don’t I always?). This little elf has been really busy buying, making, cleaning, ironing, pricing and packing for the Christmas season. Today I finished setting up the shop for this weekend’s Christmas Open House. Then I have two shows, back to back, November 21-24 (see upcoming events menu on top of this page). I may be adding another local show at the beginning of December. Why do I do all this? Because I love it! I absolutely delight in making Christmas crafts and gift items. So to get all of you normal people non-shop owners ready for the Christmas season, I am giving you a little sneak peek at some goodies I have made for my shows. Keep in mind that this is just a sampling, as a lot of stuff was already packed up before I decided to give you a peek. 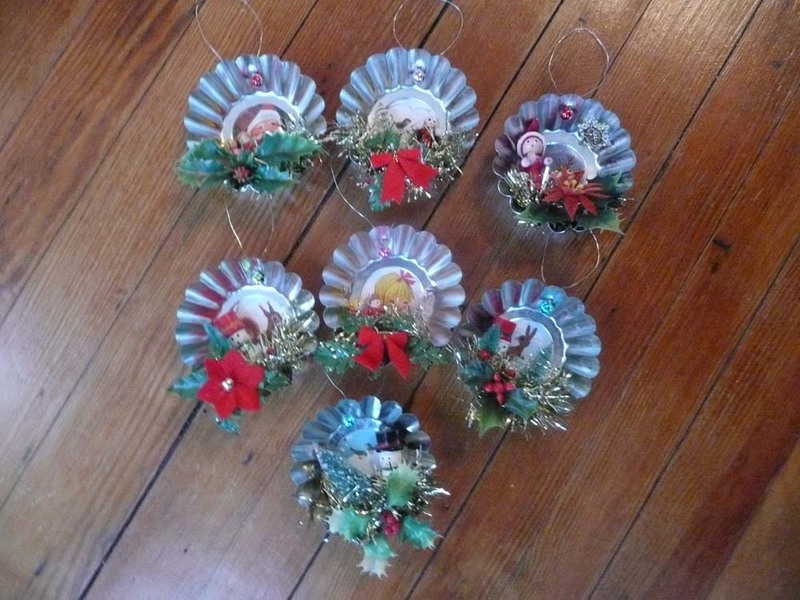 Little decorated tart tin ornaments with retro pictures, figurines and foliage (a 10 cent word for plastic flowers and ivy). 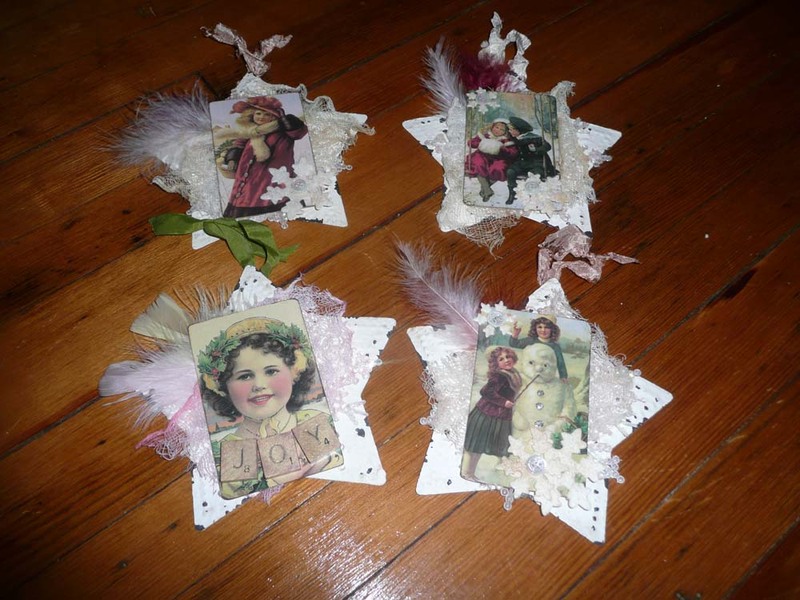 Decorated tin star ornaments with all kinds of layered goodness. My own design of cross-body bags. 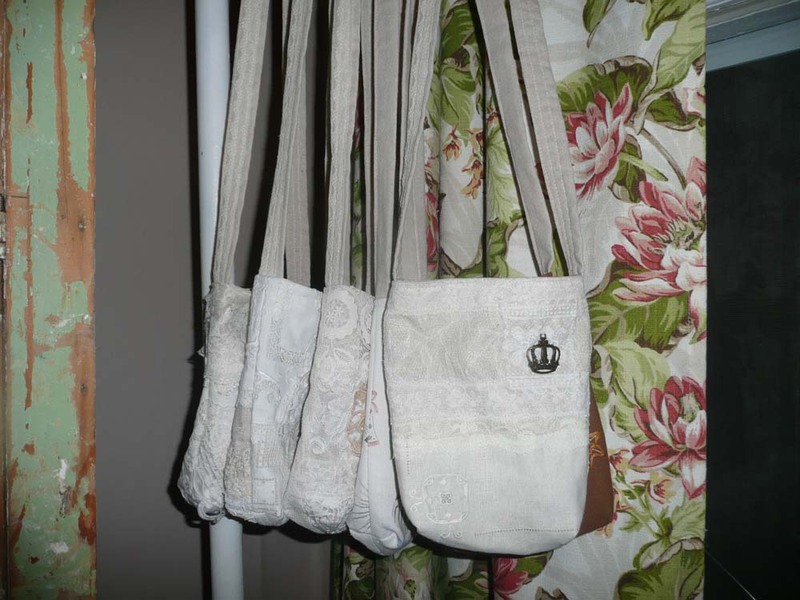 Some are covered with pieced together vintage lace and some are made from vintage Christmas linens. I still have a couple more of these to make. 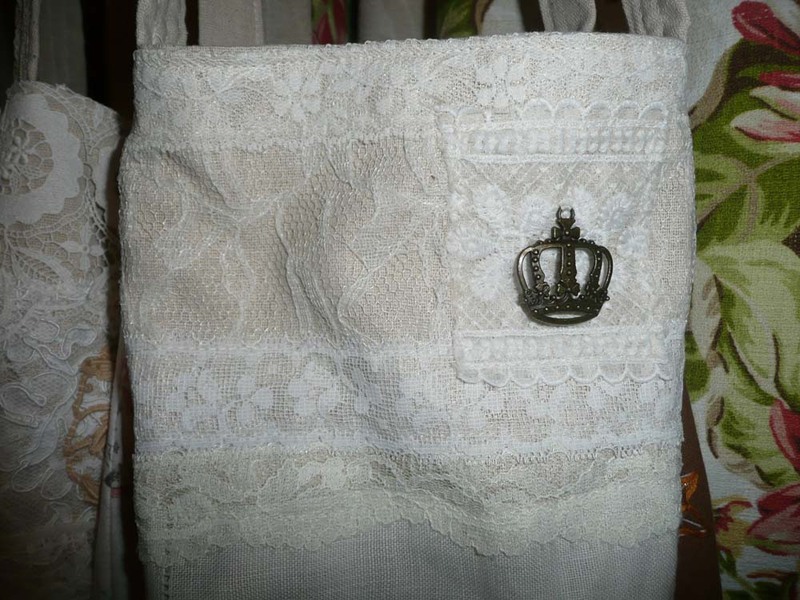 Here is just a close-up of the front of one of the bags. I really loved how these turned out. 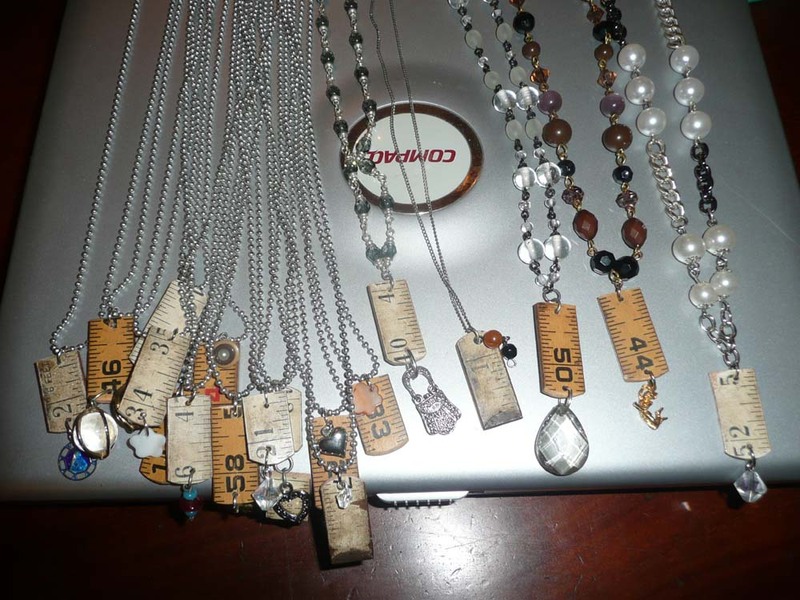 Tons of old yardstick and charm necklaces. I even made some fancier ones with beaded necklaces. These are super fun to make and no two are alike! 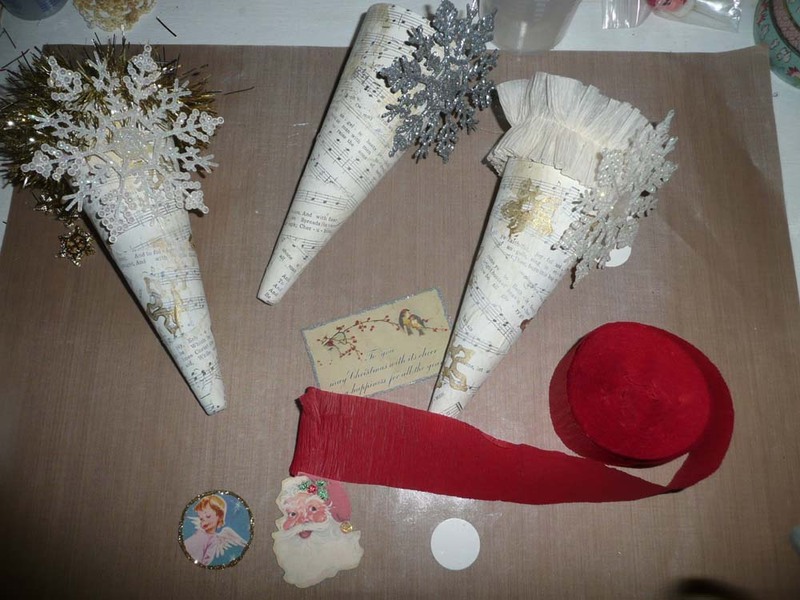 And here are some “good intention” cones. I had good intentions of finishing them today. Oh well, it doesn’t look like that’s going to happen does it? 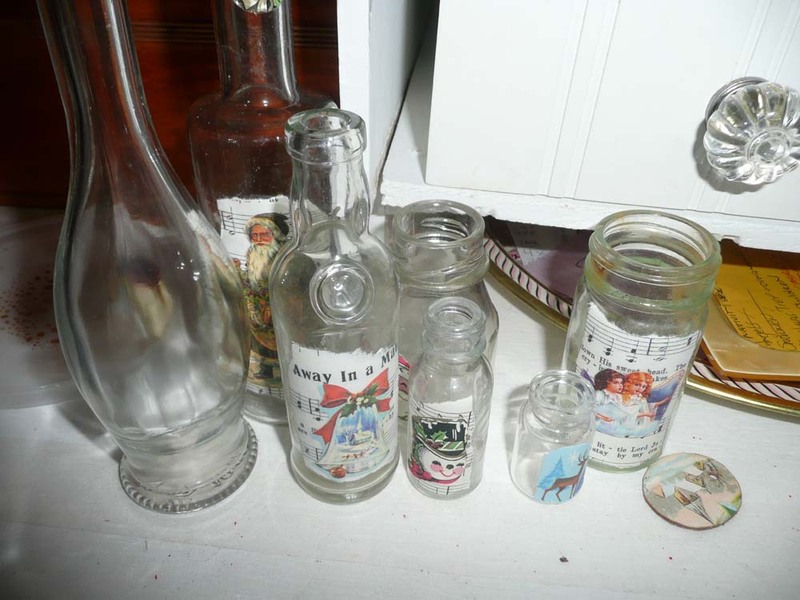 And here are some “good intention” altered bottles. They still need a lot of embellishment and I need a lot of motivation time to finish them. Well, there you have it. My excuse for not blogging as faithfully as I wanted. I really hope some of you dear readers will be able to come to “Ladies Night Out” in Bowling Green on the evening of November 21rst or to the Vintage Home Market in Richmond on November 23-24th. I would love to see my old friends and I always have time to make new ones! You have been busy. I love all your stuff. We are going to see Paul’s Dad on the Fri. after Thanksgiving but lucky for me we have to go right through Richmond so I will be able to make that show! Yippee! We made over $7,000. at our bazaar with money still coming in. We will put out some of the leftovers Nov. 20 at our Wed. night supper so I’m sure we’ll make $8,000, that is what we usually make. I always love it when we meet to distribute the money to worthy mission projects at home and abroad.